At Alouette we are proud of our members, especially when they achieve a milestone in their flying. From a first solo, qualifying cross country to NPPL or PPL. On this page we list all of those member's achievements. Congratulations to Viktor Varchola on completing his Qualifying Cross Country today in Cessna 172 G-BRAK. 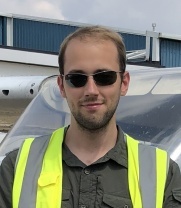 After only about three weather cancellations, Viktor became the first student to complete his QXC starting and finishing at Headcorn, as, since 1st April no solo student flights are permitted from Biggin Hill. Congratulations to Viktor Varchola on completing his first solo at Headcorn on 22nd July 2018 in our Cessna 172 G-BRAK after just under 16 hours. Viktor came to Alouette for a Trial Flight in April this year, and followed it up with a five hour pack, before joining the club as a full flying member in June. 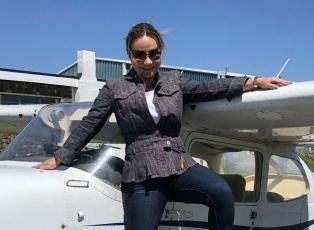 Congratulations to Olga Jarvis for completing her first solo on 27th June 2018. Olga has worked very hard since moving over with me from her previous club when I joined Alouette. And now, taking full advantage of the wonderful summer weather, all that hard work has paid off. We are all very proud of you - well done. Now on to consolidate the solo time and work towards the full PPL while the weather is on our side..
Well done to Eugeniu Namolovan having passed his skills test this June, 2009. Eugeniu has set himself high targets in his flying career and has shown determination by working in this country to pay for his training. His family at home in Moldova must be very proud of him. Like all students at Alouette his biggest problem during training was the British weather which as we know can be somewhat frustrating. Yet Eugeniu overcame this, as well as keeping shift work and travel commitments. Congratulations to Steve Aylward who recently completed his first solo. 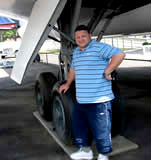 Our congratulations to Martin Rackauskas who completed his skills test at Alouette on Monday 22nd June 2009. Solly worked hard through the summer and still found time to laugh and enjoy the flying. Working nights was a little tiring to say the least and much sleep was lost due to waking up just to find the TAF wasn't quite right and flying was cancelled. Yet his enthusiasm has proved its worth and now Solly can relax a little and enjoy his new found freedom in the air. Well done. Paul completed his PPL Skills test with our CFI and examiner Don Beard on Wednesday 5th May 2010 having carried out his training with instructor Bruno Bruniges. Paul overcame the vagaries of working shifts, including night work to concentrate on the studies and the practical side of flying. He has also been seen at the Club updating paperwork, graphs, charts and making flight planning a bit easier for us mere mortals. Once Gatwick issues his licence you will no doubt be seeing him enjoying his new found freedom. 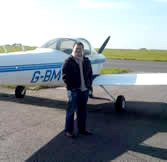 Adrian did his first solo last Tuesday 8th March 2011. The latest person to pass his Skills test at Alouette and join the pilots at Alouette is Tom Wheeler so many congratulations are in order. Tom is a very busy person ! Seen at week ends at the Air Scouts hall at Biggin helping youngsters understand some aspects of flight; then starting a new job; finding time to train and study for a PPL; then having to take a flight test !!!! Well done to Stefan for obtaining his IMC on Saturday 11th June 2011 when he passed the skill test with examiner Roger Patterson. Stefan also added a night rating to his licence, having carried out the necessary training with resident instructor Ian Davidson. Stefan completed his skills test with Alouette, and qualified as a PPL, on 24th April 2010 in just over 51 hours. Stefan took his first lesson on 28th September 2008, went solo on 7th June 2009 and completed his Qualifying Cross Country on 31st January 2010. Unusually, during his training Stefan started on the Tomahawk, then flew Echo Alpha and finally Alpha Kilo so has actually flown all the club aircraft, including two we don't have any more! Congratulations are due to Jordan who passed his skill test on the 10th of July 2011 with examiner Roger Patterson. Jordan completed his first solo last autumn and went on to take the skill test with a total of just 50 hours under his belt. Well done and welcome to the Alouette achievers page. Having gained his PPL with Alouette, then his night rating, Pete has now completed his IMC rating with Ian Davidson, taking the test on Tuesday 27th September with Roger Patterson. Commenting on Ian's instruction Pete said "He is very good and pushes you to the limit. He certainly ironed out some of my bad habits!!". Well done once again Pete, its nice to know you have that IMC when you are in the left hand seat (or the right for that matter!). Silet recently completed his first solo, having had various delays due to pressure of work. He originally began flying in our old Tomahawk G-BMTO, which we no longer have, but did his solo in the PA28 G-BUJO. Like most people at Alouette, Silet just loves flying! "I thank God for this achievement and that I am now part of the solo pilot family!" 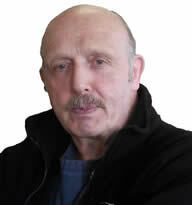 "No matter what decisions EASA and the CAA decide about our IMC rating; Gerry has one. Gerry passed the test today 6th June 2012 and now can show he has the life saving skills to fly in IMC. His training sometimes involved flights in some really dubious weather, yet his concentration always meant our safe return. Well done Gerry." With the additional pressure of doing so during the Olympic restrictions, Russell completed his first solo last Thursday 9th August in our Cessna, Alpha Kilo, with instructor James Harvey. Its a great feeling and, in his own words, he tells us that he's still smiling following his achievement! 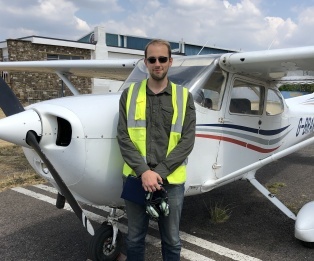 Joe completed his first solo last Saturday 18th August having satisfied his instructor, James Harvey, that he was ready for the challenge that many of us have faced. "Taking to the skies for the first time on your own is an amazing feeling, and I still have that buzz of excitement following my solo. I can't help but smile every time I look in my log book and see 'Self' under the column for 'captain'." Well done Joe! Congratulations are in order for Sam who has just completed his Skills test and is now waiting for that licence to drop on the mat, what a great Christmas present! "I started learning in February, with James. It was something I'd always wanted to do since being in Air Cadets at school, but never really found the time. So very glad I eventually managed it, flying after work, at weekends, and despite the awful weather this year and JO being out of action for a month. Took me 49 hours in the end, half and half in JO and AK. I should also really thank Don for his help, not least with all the new EASA forms and arranging the skills test with Ray Watson. Very much looking forward to using the licence as often as I can in the future"
After a long period of bad luck due to our unpredictable weather, we are pleased to report that Adrian has now completed his skills test and is waiting for that all-important document to drop on the mat fresh from the CAA. 15 cancelled Qualifying Cross Country (QXC) must be a record! It's been a long time coming! I first attempted my QXC in May 2012, where I ended up getting stranded at Manston watching the windsock at 70 degrees to the runway and wind picking up fast whilst I checked in to TG Aviation. I was rescued by Alan Powell and Noel Baker, who were at Headcorn in JO at the time and had to fly back to Biggin and jump in Alan's car for the long drive to Manston - thanks Alan!! I flew back safely with Noel at my side. A long Summer, Autumn then Winter followed with around 15 cancelled QXC bookings. I thought I would never complete the course before my exams all ran out on 9th March 2013. But, we had a small window in the weather this week so I cracked out the QXC on Saturday 2nd March (a very pleasurable trip to Lydd then along the coast to Goodwood before returning to Biggin), had a gruelling 6 hours of ground and air revision with Terry Gordon on Sunday 3rd March, a day of CAA paperwork on Monday, before taking my Skills Test with Roger Patterson from Kent and Surrey (a truly calming gent) on Tuesday 5th March! Phew - 3 days before my exams run out!! Many thanks to all who helped make this all work for me; James, Terry, Roger and Don - a big thanks to you all. And a very big thanks to my instructor and friend Noel Baker; I have had a thoroughly enjoyable journey to achieving my PPL with him. So frustrating and so close! The weather has put a lot of people off their training progress, but Steve remained patient and it paid off. Trying to get a Qualifying Cross Country flight done was proving very frustrating. Especially as, like so many others, the validity of his written tests was due to expire in a few days time! Then one morning (and it was a morning only) there was a break in the weather. Frantic 'phone calls saw Steve venture on this long flight. On his successful return to Biggin the weather closed in again. Now for some revision and the skills test all within the next few days. Booked once - booked twice - eventually got to go. I was not there on test day as I was on holiday but Steve will admit to being a little anxious - but he needn't have been. Well done Steve. Now the pressure is off you can enjoy your licence. Its been quite a year for Joe, what with moving house, the birth of his baby daughter and then completing his QXC (after 12 cancelled attempts) in June. But now he can proudly pronounce that he has that much coveted PPL licence having completed his skills test last Saturday 23rd August with examiner Ian Davidson. So now its off to the CAA to turn that certificate into a real licence. We look forward to flying with you Joe, well done. Frank has gained his IR (R) after a few months of juggling to keep those instrument needles in the middle ! Well done Frank, we all know it is not easy. A mixed 'course' of great achievements mixed with the frustration of battling cross winds and turbulence. Now Frank has proved his ability to find and land at home safely by instruments only. Have you ever been frustrated at having flights cancelled? 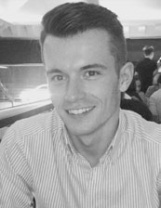 Then speak to Robbie; he managed to take his exam on the tenth booking ! Yes Tenth ! How unlucky can you be with the weather? Robbie has now succeeded in transferring his UK NPPL to an EASA PPL; having had to jump through many hoops set by the CAA at Gatwick. Now he is set for his IR(R) and Night ratings. Many congratulations to Alasdair who passed his skills test on the 6th July 2015. "I passed my skills test on December 5th with Ian Davidson in GBUJO. Despite the dreary December weather and the unpredictable cloud base I managed to pass on my first attempt. I received my licence on December 19th just in time for Christmas"
Today one of our very first "Five Hour pack" students, Tom Knynenburg, did his first solo in G-BRAK after completing just 10 hours 40 minutes formal flight training. 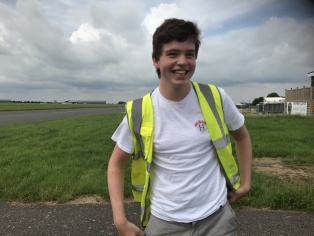 Tom, whose 17th birthday was just a week ago on 22nd May, flew a faultless training flight around the Biggin Hill circuit (thanks to Biggin Air Traffic for their co-operation and assistance). Congratulations to Gordon Hill on completing his first solo flight in PA28 G-BUJO. 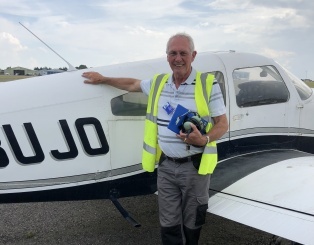 Gordon's ambition was to do his first solo at the historic Biggin Hill Airport before it becomes too restrictive for solo student flying at the airport. His ambition was fulfilled today (4th July 2018) with a solo flight around the airport on a beautiful calm day (unusual recently!). Now we move on to consolidate the solo time and move on to the advanced flying and Navigation. With the dubious honour of being the first on this new page, our congratulations to Ying Li who passed his Skill Test at Alouette on 6th May 2008. Ying did his cross country to Lydd and Earls Colne and, shortly afterwards with the weather obviously on his side (! ), completed the PPL(A) Skill Test.